Are you ready to rock and roll, mama? 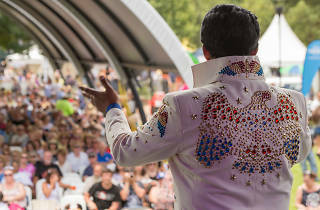 More than 25,000 people gather together to shake, rattle and roll for fives days for the annual Parkes Elvis Festival. This year, fans of the King will be grinding their hips at 150 Elvis-themed events, concerts and family focused activities. What began as a get-together for Elvis enthusiasts in 1993 has grown to become an officially endorsed event by the estate of Elvis Presley. Each year runs with an Elvis-flavoured theme, and this time around it’s ‘All Shook Up’, celebrating the song of the same name and Elvis’ other classic hits from the ’50s. So put on your blue suede shoes, bring your hound dog and spend one night or the full five celebrating the rock’n’roll original grand master. You’ll get to enjoy a program that includes a full concert series, an Elvis gospel service, street parade, look-alike competitions, rock’n’roll dancing and a vow renewal ceremony for couples whose love for each other is as strong as their love for the King. There’s also festival markets to pick up sparkling Elvis merchandise. 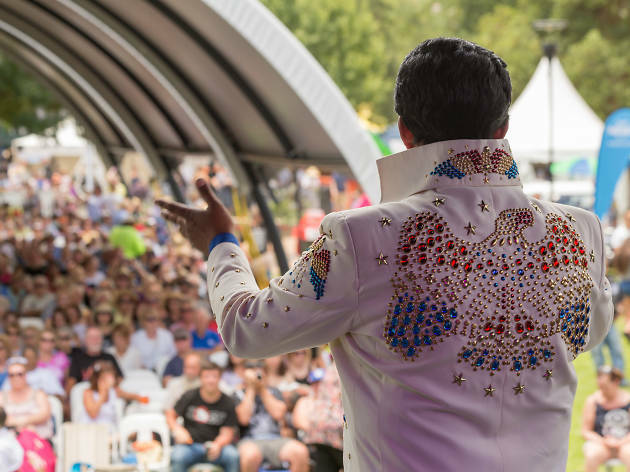 Tickets are on sale now and if you want your transportation to the event to be as rock’n’roll as possible, you can book a seat among other Elvis devotees on the Blue Suede Express or Elvis Express trains from Central Station out to Parkes.